PHILADELPHIA — Just in time for Bill of Rights Day (Dec. 15), Annenberg Classroom has released the multiplayer version of a game for middle and high-school students that challenges them to apply their knowledge of the Constitution to everyday legal scenarios. Annenberg Classroom’s “That’s Your Right” game lets students compete against each other online in a spirited, fun competition that checks their understanding of the first 10 amendments to the Constitution. Playing with online cards and tokens, students must match different constitutional concepts – from the right against self-incrimination to freedom of the press – with different kinds of real-world issues. The free game, which has different skill levels, is ideal for classes. It also has a single-player mode. When players watch short videos about the individual amendments, they are rewarded with visual upgrades and can customize the look of the game. The game was developed by Annenberg Classroom, at the Annenberg Public Policy Center of the University of Pennsylvania, in conjunction with Filament Games, a producer of educational games based in Madison, Wis.
“Games are a great way to engage students in the classroom. Annenberg Classroom’s ‘That’s Your Right’ game shows students how the Bill of Rights is important in their lives today,” said Ellen Iwamoto, the policy center’s writer/researcher who oversaw development of the game. 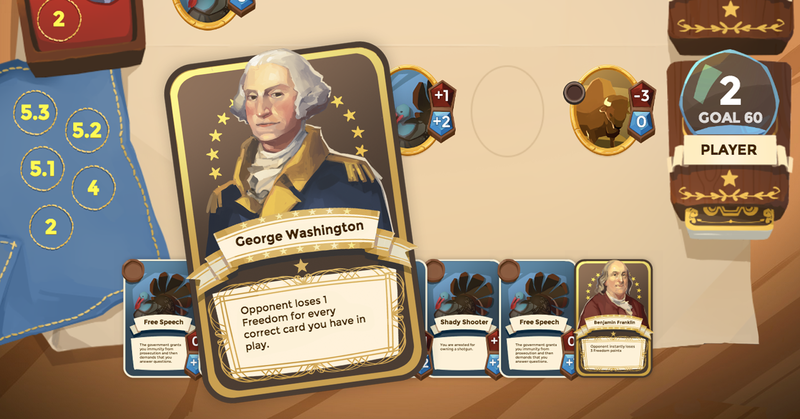 The game is part of the comprehensive, multimedia Constitution curriculum offered at AnnenbergClassroom.org, which provides free classroom resources for middle and high-school teachers. In addition to games, the website contains award-winning documentaries on landmark Supreme Court cases and constitutional concepts, daily civics news, a moderated online student discussion forum, articles called Speak Outs that are based on current events, lesson plans, downloadable books on the Constitution, a glossary, and an interactive Constitution guide called What It Says, What It Means. Click for more games on AnnenbergClassroom.org, and for the full news release.